May 16, 2018 By Goodall Staff - s.h. Your backyard is like your own piece of paradise where you can kick back, relax and enjoy the outdoors. Personalizing your yard is a great way to make your outdoor space functional and inviting. Whether you enjoy relaxing in the shade, defending your title as barbeque master, or finding ways to beat the summer heat, we’ve put together a list of ten backyard features that you should absolutely consider. Any pool owner will tell you that the benefits of owning a pool quickly outweigh the cost of having one. Not only are pools a great source of fun and excitement for the whole family, swimming has countless health benefits like relieving stress, building muscle, improving cardiovascular health. Not to mention that installing a pool can significantly increase the value of your property. If your backyard is on the smaller side and unable to accommodate a full-sized pool, then an outdoor swim spa is perfect for you. With a swim spa, you can get all the benefits of having a pool with the added bonus of ergonomic seats, powerful hydrotherapy-inducing jets, and a user-friendly control system so you can adjust the temperature to your liking. If you’re thinking of investing in a swim spa, click to find out 6 reasons why you need a swim spa in your life. Wouldn’t it be nice to come home after a long work day and unwind with a powerful massage from the hydrotherapy jets of a spa? We think so too! spas not only help you relax, they also provide added health benefits like alleviating aches and pains, improving sleep, and can even help you lose weight. Interested, here are 7 amazing health benefits of spas. A cabana is the perfect addition to create a backyard oasis. Perfect as a poolside addition or simply a freestanding feature, a cabana offers the versatility to personalize your yard. You can use your cabana to entertain guests, set up a home gym, or build an outdoor kitchen. Plus, the extra storage space makes it perfect for storing your patio furniture from the elements. Typically built to cover walkways, you can also build a pergola to expand the roofed area of your yard to add additional protected seating, shade your spa installation, and even increase your privacy. The beauty of a pergola is the endless backyard possibilities that you can create! Go beyond the standard BBQ set up and spring for a deluxe backyard spot to prep, grill and even chow down. Do you want your very own pizza oven? What about a built-in smoker? The best part about a BBQ pavilion is the ability to personalize it to suit your needs. Exterior lighting is a quick and easy way to boost the appearance and functionality of your backyard, as well as highlight your home’s décor. You can add lights to illuminate seating areas, highlight pathways and draw attention to your most important backyard features, like your outdoor swim spa or flower gardens. A well-lit backyard also provides added safety and security by making it less attractive to potential intruders. One of the quickest ways to revamp the look and feel of your backyard is with the addition of outdoor furniture. Perfect for relaxing with a book, soaking up the sun, or hosting guests, outdoor furniture is always a great investment. There are endless options to allow you to create the look you want no matter the size of your backyard. Say goodbye to tracking dirt debris back into the house by adding a few functional pathways to your backyard. Pathways help provide a direct route to key areas of your yard, like to your outdoor swim spa, pool, cabana or outdoor seating area. You can construct pathways using gravel, stone, or even wood to help match the overall look and feel of your yard. Satisfy your inner child by taking a bounce on your very own trampoline. Apart from providing endless fun for you and your family, a trampoline is also a great source of exercise. Trampolines provide a low-impact way to get your heart pumping and improve your cardiovascular health and lymphatic system. They also help to improve your balance and coordination. If you’re looking to revamp your backyard features, feel free to get inspiration from our backyard experts at one of our five convenient Pennsylvania swimming pool dealerships. 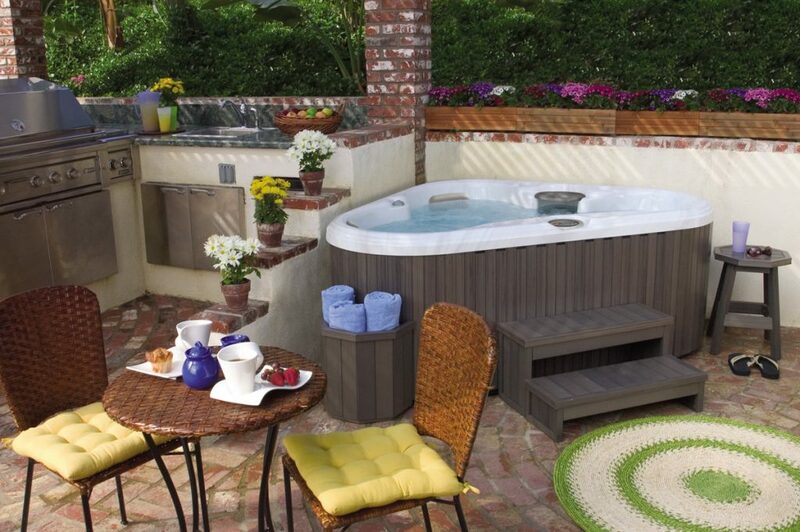 We have a wide selection of affordable and high-quality backyard features including Hydropool Swim Spas, in-ground pools, above-ground pools, Sundance® Spas, Viking Spas, and Dream Maker Spas in stock.